What’s funny about that background is… well, there are actually two things. The first is that I completely forgot to add a background because having so much SNOW in the foreground totally distracted me. The second is that the mottled blue reminds me of those generic portrait backdrops photographers would use for grade school school portraits and such back in the day. It really is a portrait in both the best, and the worst, senses of the word. Word on the street is that Ann Coen plans more of these mini-sessions this Summer, so keep your eyes on the Gallery for details. It is truly brilliant. Hopefully they’ll let me bring in a Snow Owl. Then I can finally get a decent background. What’s most funny about this post is that the generic owl portrait which illustrates it is exactly the type of picture I (kind-of, not-really) stopped taking after meeting… wait for it… Ann Coen. I’m a wildlife biographer, not a wildlife photographer. My illustrations are just that… a visual to illustrate the story. I’d been taking pictures for years, but had never even seen a real photograph until the first time I visited Ann’s gallery. It was Ann’s work which inspired me to recognize that all of the detail and emotion of a story could be contained in an image. That an image could be as specific and unmistakable as 1,000 words. While writing this I went back and re-read the 2013 Reading Only Some Pictures Tell Stories and I’m amazed at how true those words still are today. I almost never achieve the ideal she put in my brain, but I continue to struggle towards it because it leads me towards a better place and brings me a ton of joy. But most of all I’m amazed that, despite all of the above, how much, sometimes, I still love just-Snowy/no-Story. Probably because I feel like I can just reach out and pet him! 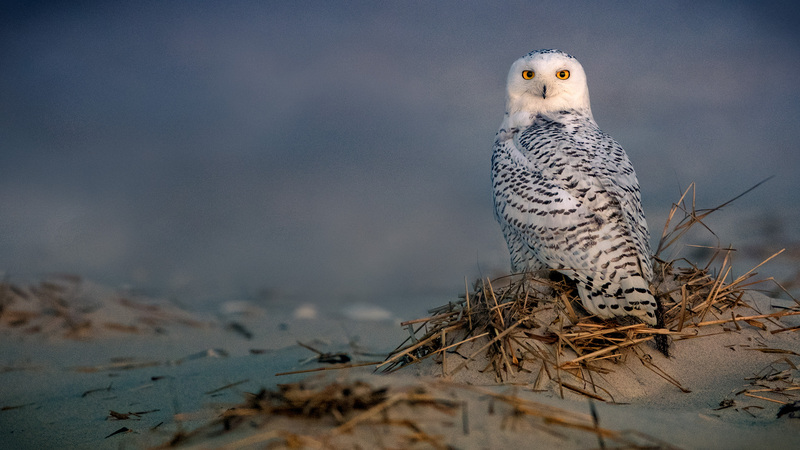 Posted in Wildlife and tagged ann coen, LBI, lbi snow owl, Long Beach Island, snow owl. Bookmark the permalink. I noticed that the owls back is facing the camera, and the head is typically owl..turned all the way around. I love this blog, all of your wonderful pictures, and most of all, all of the wonderful descriptions, information you share! Yes, I love this pose. And that’s not a full turn… this owl can actually do several more degrees towards the back which I actually have in this same series. But this one is special because there are two things I like to capture in a Snowy: the eyes (because they hypnotize) and the tail feathers (because they identify)! No false modesty here. I love my own art… if it didn’t amuse me very deeply I would not be doing it at all. And I love this photo. It should be obvious (as a photographer) how difficult of a shot this is to pull off and how much preparation and planning went into it. Ann is one of the true masters: both as an artist and a business woman. She is an Island treasure. Her work inspires me in the truest sense of the word: she makes me see a world beyond what I can see, that I did not know existed. Your pics are outstanding and the commentary is right up my alley 🙂 I just read an Osprey sequence of yours where you use timestamps to tell the story of the action. You are on notice that I will probably steal that trick at some point! Thanks as always for reading along and your kind words. And I’m proud to have been part of your inspiration for sinking even more money into gear. Oops, Pow, Surprise! In Blue.